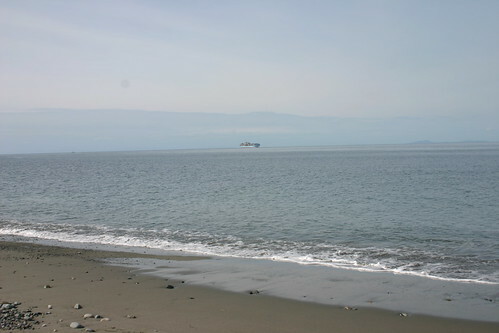 this is a picture from the time kelly and i spent on the beach in port townsend before checking in at artfest. the day was incredibly beautiful and warm and sunny. we had this gorgeous weather for almost the entire time we were there. how lucky we were as the pacific northwest can be a bit fickle this time of year when it comes to sharing beautiful days. i had such a good time with kelly. we spent almost a week together and were with one another almost the entire time, other than when we were in our respective workshops. she really is one of the most amazing people i know. her caring, generous spirit and open nature teach me something new all the time. i am lucky to call her my friend. i have been absent from my blog more than i would like over the last few weeks, and i could list several reasons. in these last few days, though, part of the reason is because i have found myself in a bit of a funk. this funk came to a head today as the rain turned to hail and the wind blew and blew. my husband called to find out if he should pick anything up for dinner and i ended up picking a fight for no reason at all. my excuse, “i just feel lonely.” odd, i know. tonight though, i am finding some gems in the midst of my pout and am trying to give myself permission to just let the pout go to settle into the goodness. a friend called on her drive home from work just to see how i am doing. jon made tacos, which does make me really happy. i felt my spirits lift a bit after i had food in my belly. i felt the creative spirit in me dance a bit this evening…just for a moment…inviting me to begin to have fun again (i think it has been resting since artfest – just plain tuckered out as they say). i finished the scarf i was crocheting (it is my third. i am in love with double crochet) and even though it didn’t look like there was enough yarn left to finish one more long row (i crocheted it long-ways…or however, you say it), there totally was…with a few inches to spare! my husband grew a beard while i was at artfest and during his spring break last week. this weekend, i asked him to shave it into a goatee for fun and he has totally kept it. it cracks me up in the best of ways because he just looks so adorable. i love it. i decided it is really okay if my website is not perfect by my deadline for myself (which was my oddly chosen date of april 10, which is, in fact a tuesday, and that simply does not work at all…so i will in fact get it done whenever the heck i can). i spent time looking at the workshops for artfiberfest. because the best way to get over your post-artfest funk is to look forward to the next time you can get together with such amazing, creative, kind-hearted, wonderful folks! my cheeks are hurting so much from laughing at this random show i found tonight. it’s called “thank god you’re here” and it is a sketch-comedy show on nbc. it is pretty silly but seems to be just what the doctor ordered as one cannot be a grumpybutt when one is laughing until one’s cheeks hurt. i allowed myself to remember that i have a choice to make about how i spend each moment. that it is okay to waste some time watching bad tv, but that i do not want to give myself permission to waste away all the moments when the loneliness creeps in. no, that is not the choice i want to make. i know there is much i feel called to do. and that the time to begin is now. how are you pulling yourself out of the moments of pouting or funkiness in which you might find yourself lately?